Lorena from Madrid, Spain is the star of one of the Rare Disease Day 2019 patient testimonial videos (coming soon!). She lives with Phelan-McDermid syndrome, a disease linked to chromosome 22q13 that affects synaptic reception and impacts cognitive and motor development. 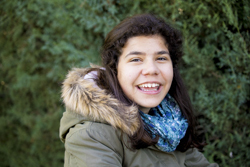 For Lorena, Phelan-McDermid syndrome also presents with an autism spectrum disorder, which means that although she is very sociable she can have difficulty relating to others. When Lorena was seven months old, her mother Norma began to notice that something was not quite right. They started going to doctors who insisted that they needed to be patient as ‘each child has their own rhythm’. 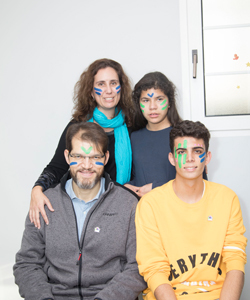 Despite further medical tests the diagnostic odyssey continued for Lorena and her family, and it was only after three years of waiting that she was properly diagnosed. Lorena’s family initially learned sign language to communicate with her, but unfortunately her motor skills weren’t sufficient for it to be useful. They tried the same thing with pictograms but also to no success. Finally, Lorena started working with a speech therapist and after some time managed to start saying words. Norma describes this as the moment when she realised that their efforts were starting to pay off. Now, age 14, Lorena still continues to go to speech therapy session and her speech continues to improve. Lorena is supported to become more independent in her routine with the help of her occupational therapist Luna. She helps Lorena by giving her resources and strategies to become more autonomous in her daily activities. Lorena’s favourite activities include riding her bike around the garden and doing jigsaw puzzles. Although she can be very energetic and can find it difficult to concentrate on some activities, she is always calmer when her brother Victor gets home and they can watch TV together in the evening. At dinner time Lorena helps out by setting the table with Luna. Lorena is very proud of her big brother and enjoys being there to enthusiastically cheer him on during his football matches at the weekend. Lorena’s mother Norma recounts one of her favourite memories: "I thought she was never going to be able to talk and one day she said 'I love you.' All parents want their children to be happy and I am most concerned about the happiness of her brother, because Lorena herself is pure happiness!"